Actual Size: 31 feet long, 10 feet wide, 13 feet high! Outlets: 1 standard outlet must be on during use. Caterpillar Combo 3N1: Jump, Climb and Slide! This three in one gives you more bounce for your buck! The Caterpillar Combo has a good size jumping area, a two lane climbing rock wall 'hill' with mountain climbing rope to help pull yourself up, and then after you scale the mountain - an awesome, safe, sliding down the other side! Fully enclosed so no one jumps off the slide, well ventilated screened netted windows for visibility this playful unit is: 31 feet long, 10 feet wide, 13 feet high! This delightful caterpillar is ready for your children today! We recommend two people to supervise this unit, one person at the jumping area and one at the slide area. Go with the Happy Caterpillar 3n1 Combo for an incredible impression and enchanted party! This awesome party pleaser has just been reduced and still rents for a full day. 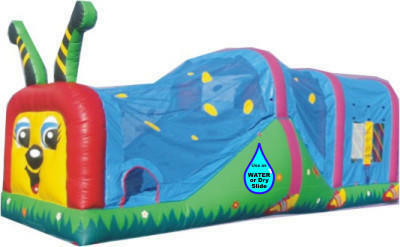 Seasonally the Caterpillar can also be used as a water slide for $50.00 more, though this is sometimes on sale. Children 4 years through 9 years will love this fully enclosed jump, climb and water slide. Children 3 1/2 through 12 years can enjoy this combo unit. Minimum height 36”, unit is not suitable for adults. Summer special; dry or water slide combo; This unit is perfect for those that want to slide and those that just want to jump!